Being a kid is great. Your toys aren't just toys, they're real. And your bedroom or table top can serve as the terrain for your imagination. Does Xbox Live Arcade game Toy Soldiers capture the feeling of playing with toy soldiers? Developed by Signal Studios, Toy Soldiers is a tower defense game in which players much defend their toy box. There are various types of arms—machine guns, mortars, anti-aircraft, cannons—that players can set up to defend the toy box as enemy soldiers and vehicles attack in waves. Destroying your enemy results in earning money that can be spent on new weapons and upgrades. What separates Toy Soldiers from a typical tower defense game is that it allows players to jump into the action and directly control machine gun turrets, cannons, airplanes, tanks and more. It even allows player to shoot down enemies from the sniper's nest! Innovation is great, but let's see if Toy Soldiers towers over the competition and emerges as the victor in a market increasingly saturated with tower defense games. Masters of War: Toy Soldiers is populated with World War I toys, which is utterly refreshing considering how many World War II games there are. WWI saw machines and chemical warfare face off against soldiers on horseback sporting pointy helmets. Visually, it's striking, and the toy version of it is is even more so. The worse thing about the video game industry is how it gets stuck in ruts, and there becomes a real reluctance to branch out. War is obviously a logical backdrop for a game — there is innate conflict. Glad to see one studio look beyond WWII and modern military conflicts for material. In My Room: There were times that I marveled at how toy-like the toys look. It actually felt like I was eight-years-old and playing with toys on the coolest diorama imaginable. Then there were other times that I was sucked in, that I forgot that these were toy soldiers and it seemed like I was thrown into the heat of battle. I was fighting in World War I. The true beauty of Toy Soldiers is how easily it draws the player in, while not being afraid to break the fourth wall, showing things like a desk lamp or the room space that exists out of the battlefield. All Along the Watch Tower: Tower defense games are great fun. But the gameplay is typically stop-go or vice-versa. Players set up their towers and then they sit there and watch them destroy the enemy. Because of that, tower defense games rarely feel fluid. What Toy Soldiers does is allow players to enter the fray — directly! You can man guns, fly planes and drive tanks. It not only adds another aspect to the gameplay, but helps prevent complaints about the ineptitude of the game's A.I. Best of all, it genuinely makes the game exciting. It's only March, I know, but this has to be one of the best digital titles I've played this year. From the presentation to the gameplay, Toy Soldiers is truly a joy. Signal Studios should be proud of their effort. Toy Soldiers is something special. 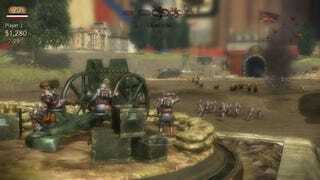 Toy Soldiers was developed by Signal Studios and published by Microsoft. Released on Xbox Live Arcade on March 3. Retails for 1200 Microsoft Points. A copy of the game was given to us by the publisher for reviewing purposes. Played through the single player campaign and tested multiplayer.